Put your best foot forward with professional instruction by SalsaNow instructor Niss Albaig. With a focus on fundamental technique and leadable moves, this dynamic instructor will have you dancing with style and confidence. Always making learning fun and entertaining. Niss' expertise combined with sincere desire for his students to attain high proficiency in dancing will enhance the learning experience. Walk In and Dance Out! Classes feature LA Club Style Salsa On1. Additionally, Niss teaches other Latin dances encountered at the Latin club and found in social settings - Bachata, Cumbia, Merengue, Cha Cha Cha, and Latin Hustle. Beginner, Level I - Learn basic footwork and timing. Focus on foundation technique. Basic partnering steps. Advanced Beginner, Level II/III - Begin the fundamentals of leading and following. Master basic patterns and combinations. Intermediate, Level IV - Learn how to lead or follow interesting and fun combinations. Salsa Technique or Social & Club Dance - Specially scheduled classes will focus on salsa technique or introduce other popular club dances such as Bachata, Cumbia, Merengue, Hustle or Cha Cha Cha. No partner necessary. Walk-Ins welcome. Classes are held in studio as scheduled. Cost $10 each lesson. Learn important foundational salsa elements and steps for a solid start to dancing. Each week the basics will be reinforced with new basic elements added for progression. Intended for beginners of all levels. Practice makes perfect. Don't be afraid to take this class over and over again until you are comfortable and you can then move into the 7 pm Advanced Beginner II-III lesson. Further your basic elements of dance with emphasis on technique and introduction to more advanced concepts, lead & follow, combinations and steps that will prepare you for the Intermediate level. Learn the core patterns and techniques that will take you dancing on the dance floor with ease all night long. Intended for beginners already familiar and comfortable with the basics. Add fun and sizzle to your dancing with new combinations and variations. Flashy steps and leadable patterns are taught every week with emphasis on technique, footwork and styling. This class will focus on combinations, how to lead and follow them, executing them on different dancers throughout the class. If we do not have enough men to women ratio, we do a class that focuses on spinning, balance, footwork and arm techniques. Intended for dancers ready for a new level of complexity. Dance Dance Dance - One little salsa step at a time. LESSONS AND DANCING - Group lessons followed by an evening of dancing. Cover of $10 includes club admission, lessons, anddancing. Please check the SalsaNow website often for schedule, full details and current classes being offered. Learn to dance salsa in 3 hours! Get $5 discount per person for registering two as a couple (lead & follow). You can complete the entire registration and payment through Eventbrite, or pre-register in person at the studio using check or cash. This class is for the advanced beginner dancer. Each class will focus on a specific element in leading several simpler turn pattern combinations. This is a great course for those interested in initiating more complex turn patterns and moving on to the Intermediate level class. These 4-Week Progressive classes will take the skills acquired in previous level classes and allow you to advance as a social dancer. You will learn a variety of cohesive fun patterns with smooth transitions. This class is for the intermediate level dancer. Each class will focus on a specific turn pattern combination. This is a great course for those interested in executing more complex turn patterns and moving on to the higher level class and proficiency in social dancing. This 4-Week Progressive Bachata session will take you through the most popular steps and patterns danced in Bachata. 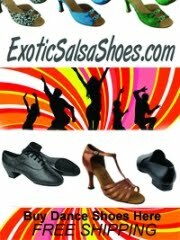 Fast gaining popularity in US Salsa club scene, Bachata is a slower latin dance, originating in the Dominican Republic. Within a few easy lessons you'll be able to express your "Bachata soul" with feeling and zest. Each class builds on previous classes and attendance every week is highly encouraged. This 4-Week Progressive Latin Hustle session will take you through the most popular steps and patterns danced in Hustle. Hustle dance originated in the Hispanic communities in New York and Florida. They are based on older dances like the mambo and have some steps from famous dancing styles like the swing dance and salsa. Still evolving and much used and enjoyed in larger dance scenes, hustle can be danced to any even beat music in dance clubs and studios. Each class builds on previous classes and attendance every week is highly encouraged. This 4-Week Progressive Club Cha-Cha-Cha session is specifically designed for the Salsa dancers who want to join in the fun whenever the DJ spins a fabulous Cha-Cha. During this course you will be taught timing and footwork, essential fundamentals, and will quickly progress into Cha-Cha patterns and conversion of common Salsa patterns into Cha-Cha. Whether you're a salsa dancer or not you will find this course essential for social and club dancing. This 5-week progressive session will provide a great platform for those who are just starting to dance and for those have been dancing to jump to the next level of their dancing skills, build up their confidence, add-on styling and enjoy the Rueda de Casino which is a great way of socializing wherever you go! Beginners after 5-week progressive session should be able to use the Cuban steps and fundamental steps they have learned in practice including partner work and Rueda De Casino and therefore be ready for advancing into level II Salsa Cubana and Rueda De Casino. Beginners should be able to dance upon completion of this session with full confidence. People with experience in Salsa and Rueda De Casino should have learned more new steps and exciting figures as well as styling in both partner work and Rueda after the progressive Salsa Cubana level 2 and Rueda De Casino and therefore should have built skill in Salsa Cubana and enjoy Rueda in a more stylish way than before with confidence and ease. This level is for those people who are starting fresh from scratch, we will be focusing on music, fundamental steps and body movement, partner work as well as introduction to Rueda de Casino throughout the session. These classes are designed for those who have been dancing salsa before and have a reasonable understanding about salsa and know their basic steps well, therefore we will be focusing on cool figures, partner work, styling and Rueda de Casino in these classes. By appointment only. Available for private or group instruction and entertainment at your location or ours. Please check the Services page for more details and rates.